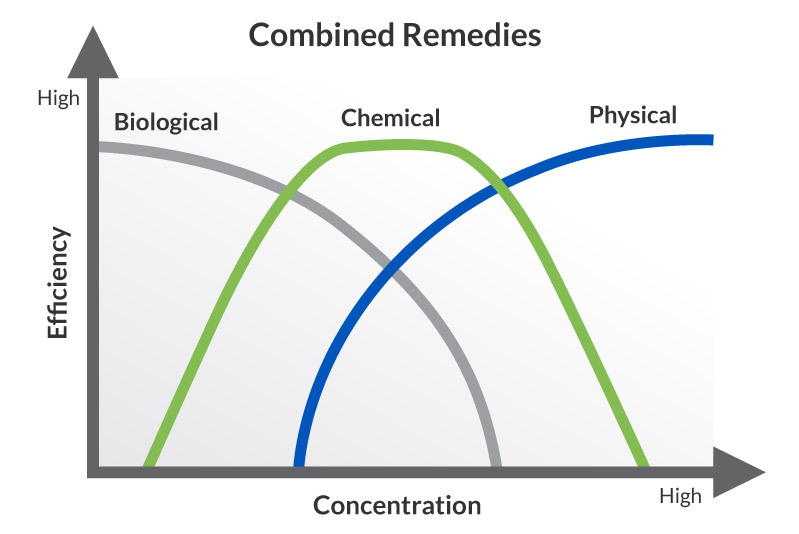 Integrated treatment approaches, also known as combined remedies, describes the combined or sequential use of multiple remediation technologies to improve overall efficiency and results at lower cost than the use of a single technology alone. Remediation practitioners can combine biological, chemical and physical remedies to treat a wide range of site conditions and contaminant concentrations by leveraging the strengths of each technology. For example, in situ chemical oxidation (ISCO) is an effective and proven approach for treatment of source zones which are characterized by high contaminant concentrations in groundwater, sorbed contaminant mass, and the potential for residual free product. However, ISCO becomes less cost-effective in low-concentration areas where contaminants are mostly dissolved and more widely dispersed. As a result, other approaches such as enhanced bioremediation are often more effective in zones characterized by low contaminant levels. An integrated approach beginning with ISCO for mass depletion followed by a transition to enhanced bioremediation for further treatment to low cleanup goals is a proven integrated treatment approach. These strategies can help secure lower cleanup targets more quickly and at lower cost than either ISCO or enhanced bioremediation alone. REGENESIS welcomes the opportunity to provide you and your team with the tools you need to successfully plan and execute your next combined remedies project. If you currently have a project and need a remediation solution now, request a design. Simply have some questions or want to explore some ideas Contact Us to get in touch with a local representative. Get more information about the use of REGENESIS products with Integrated Treatment Approaches in this Case Study.